How many times have you wished you had some type of holster to carry around your T-handle shovel? Don’t most of us walk around carrying it in our hand, or slung over our shoulder as we detect? It can be cumbersome, especially in the woods, or when walking or hiking long distances. I’ve found myself in this shovel predicament many times. I tried rigging something up with bungee cords, but had no luck. I searched hardware stores for some type of belt carrier to fit the T-handle, and even cut a hole in an old detecting pouch trying to solve the problem. Nothing worked to any satisfaction, so you can imagine how thrilled I was to receive a neat new product called the “Ready Shovel” to test and review. 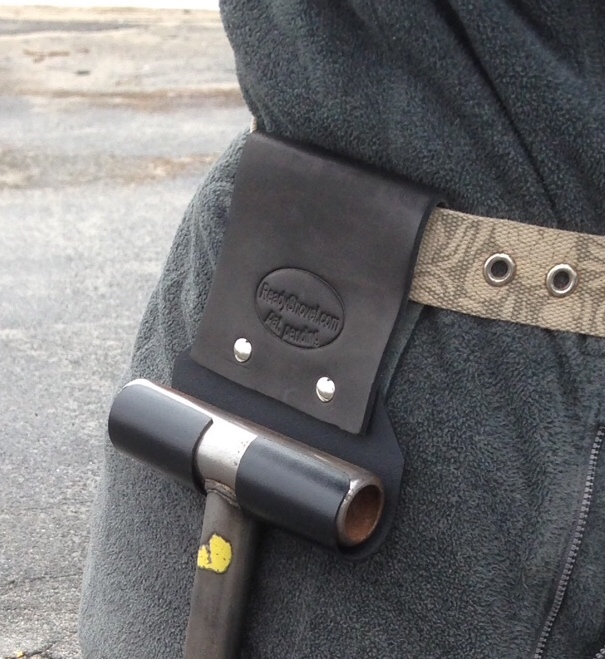 The “Ready Shovel” is a belt carrier for a T-handle or D-handle shovel. It has a handle support made out of Kydex (a high performance, durable plastic), which holds your shovel in place as you detect. To use the carrier, you just attach the leather belt loop to your belt, push the handle of your shovel into the molded plastic carrier and it pops into place. Once it’s in place, your shovel will stay in the carrier until you need it, at which time, it easily pops out for use. I couldn’t wait to give the Ready Shovel a try, and as soon as the weather broke, I was out the door with my machine. I slipped the carrier on my belt, pushed my T-handle into the holder, and started swinging. Initially, I kept forgetting I had the carrier and was walking around holding my shovel until I remembered –hey, I’ve got a carrier for that—but once I got used to it, I thought it worked quite well. When I needed my shovel, I just popped it out of the carrier, and when done, pushed it back in—Easy. I’ve only used the Ready Shovel for a few weeks, and knowing how rough I am on my gear, I was concerned about how the plastic handle support would hold up over the long term, so I contacted the manufacturer with my concern. The manufacturer assured me that the plastic is “tough as hell”, and they have done many tests with the carriers, in addition to using the holders in the field themselves for years, with no breakage. The Ready Shovel is very simple, yet very cool–it just makes sense. I think it’s going to be a popular new piece of must have gear for many detectorist’s in the field. The price point of the ready shovel is also reasonable @ just $16.95, and they are made in the USA. The manufacturer also makes a ball handle shovel carrier, a sand scoop carrier, and an XP Deus Water Antenna. You can check out their products, and order directly from their website at www.readyshovel.com. Imagine one in pink camo?–a fashion accessory for the discerning Diva.. I have to say she looked very nice with it too. Awwww you’re too kind. I know I’m a sight to behold, all covered in site mud, but I didn’t think you noticed my gear. How did they solve the problem of the knee capping? I tried a similar gizmo once a couple of years ago and the shovel head kept banging into my knees until I fell to the ground into a fetal position and sobbed loudly for a little while. Hey pull tab – I didn’t experience any knee capping, so I’m not sure. I keep the holder on my side, and every once in a while I could feel the shovel against my leg, but that’s all. Are you using the short, low profile t-handle or the long one.? Sorry about your knees, I would’ve cried too.